That sums up the plight of the 2015 Garden City boys lacrosse team. 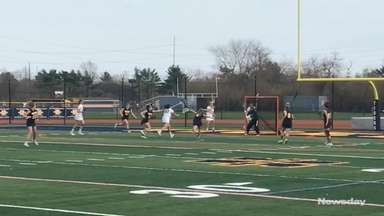 The longtime powerhouse stands at 3-5 after Saturday's 8-7 loss to Ridgefield (Conn.) in a non-league game that was the first of a Lacrosse Day doubleheader at Garden City High School. "We're not used to being 3-5. That's not typical for Garden City," Trojans coach Steve Finnell said. "But it's not for lack of effort. We competed and we had some chances. We've got to clean up some mistakes -- like those missed ground balls and turnovers." Those mistakes are especially costly against the top-flight non-league schedule that Garden City has played every year under Finnell. "When I played in high school, we always played Yorktown," Finnell, a Garden City graduate, said of the Westchester power. "Win or lose, you get better when you're challenged. You don't get better in blowout victories." 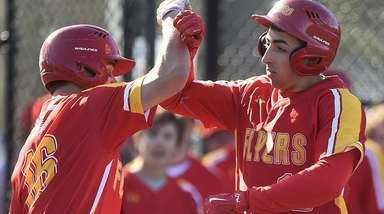 The Trojans stayed step for step with Ridgefield (4-0), the No. 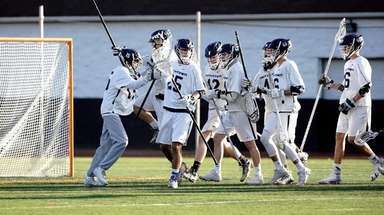 1-ranked school in Connecticut, the latest in a who's who of top Northeast opponents. Class B Garden City has lost to Class A Syosset (No. 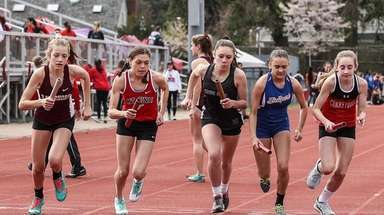 3 in New York), Class A Massapequa (No. 2 in New York), Class C Bronxville of Westchester (No. 1 in New York) and Duxbury, No. 4 among public schools in Massachusetts' East region. The Trojans beat St. Paul's of Baltimore, No. 7 in Maryland's acclaimed parochial division. "If you get tripped up against those kinds of opponents, there's an opportunity to get better," Finnell said. 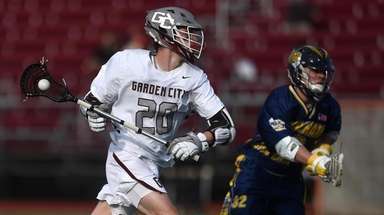 So Garden City can build on rallying from a 7-4 deficit against the Tigers to get within 7-6 on Luke McDaid's goal with two seconds left in the third quarter. Ridgefield's Simon Mathias (three goals, two assists) scored unassisted with 10:09 left, but McDaid answered with his third of the game off a feed from Conor Muldoon (goal, two assists) to make it 8-7. Twice Ridgefield ran off long possessions without scoring, but that strategy almost backfired when Trojans defenseman Matt Borges forced a turnover with 30 seconds left. Tyler Wuchte's shot from the high slot was easily grabbed by goalie Brendan Winne with 11 seconds left. "We had no timeouts left, so we had to just play it in transition," Finnell said. "We missed. But we'll learn. That's the whole point of games like this. Our hope is that by May, we'll be a dangerous team and a threat in the playoffs." That's familiar territory for Garden City.